Musical artist Kanye West had two major events on the agenda on Sept. 29: perform on Saturday Night Live and release his latest album “Yandhi.” He did appear on SNL, but instead of dropping the album he gave the show’s audience a long-winded speech after credits rolled, commenting on President Trump, racism, and other topics. This speech is not West’s first outburst of this nature, as he has commented on mental health many times, gone on tangents on Twitter for the majority of 2018, and even met with Trump on October 11 to talk about unemployment and prison reform. After a now infamous appearance on TMZ in May, many supporters and detractors of West turned their backs on him, and planned a boycott after he claimed slavery was a choice. 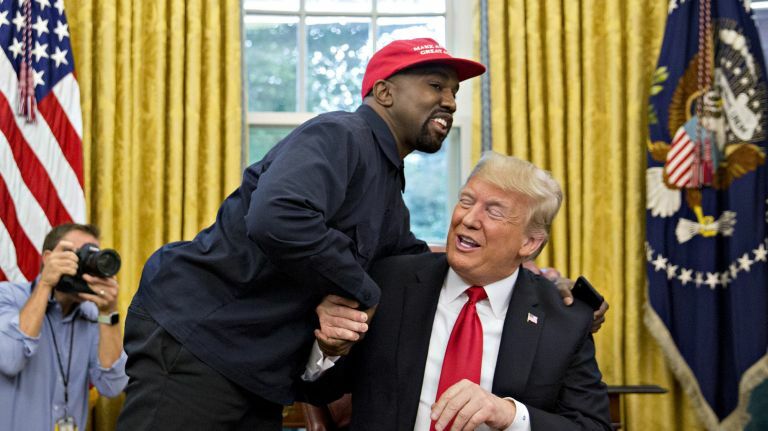 West is both notorious for his wild album rollouts and his memorable SNL appearances, but this latest stunt coupled with his meeting at the Oval Office may indicate this is the farthest Kanye has ever pushed the envelope. Celebrities including Lana Del Rey and Chris Evans have criticized West for his statements, along with many fans who feel let down by his political stance and brash approach. To many, West supporting President Trump feels like a betrayal to the black community and a downhill spiral for a man who is considered a genius, at least musically. While the media has mostly only reported this side of the response, there are many diehard fans who still remain faithful to West. Both Kanye and members of his team have apologized and offered elaborations on his wild claims, which allow a thoroughly developed opinion to be voiced after the fact. It might be a reach to say West has some interesting ideas backing his outrageous sound bites, but the majority of people are not reading past the headlines. After releasing “Yeezus” in 2013, “Yandhi” is speculated to incorporate themes of love and tolerance, a la Mahatma Gandhi. All in all, West seems to primarily have an issue with speaking before thinking. He has explained that his fascination with Trump stems from the idea that if a figure as controversial as him can be elected President of the United States, then so can Kanye or anyone else for that matter. West is a strong believer in taking the unconventional path, which Trump’s election represents to him. After saying the 13th amendment (which outlawed slavery) should be abolished, he clarified that its existence proves slavery never ended and that society should know that slavery is evil without a law telling us so. He also expressed wishes to create a larger workforce for prisoners and reduce the U.S.’s export industry. The 13th amendment comment is a great of example of the good and bad of Kanye’s media presence; a legitimate idea overshadowed by an attention-grabbing claim. Everyone has their own opinion about Kanye West, but eight Billboard #1 albums prove there is a method to his madness.